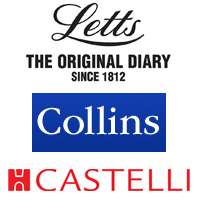 Hand out a batch of Letts, Collins or Castelli promotional diaries and you'll gain customer loyalty and future business opportunities very quickly. We've seen huge results with company diaries and over the last 15 years we've had many a satisfied customer. 12 months of advertising is significantly better when coupled with a quality business gift. 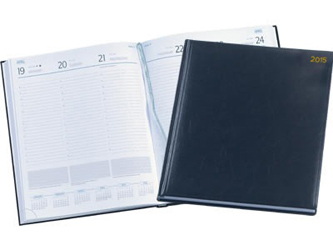 Day-To-Page and Week-To-View diaries are available in A4, A5 and A6 sizes but the best option is a quality A4 Castelli Diary with a week-to-view layout. They are absolutely fantastic and they ooze quality and panache. Our Company Diaries come in many different shapes and sizes so when you decide which one suits you best we'll ensure that your personal details get printed upon them successfully. It's a winning solution to provide a cost effective business gift that provides a years worth of advertising in such a personal way. Diaries are personal, and it's a necessary promotional gift as the performance-to-price ratio is fantastic. In a familiar way to calendars, a company diary offers a very personal form of advertising. It's your very own little silent salesman; sitting on your customer's desk and promoting your business' branding and logo on a daily basis!